This was the scene of the first day of Dillon and Nai Nai's visit last year. We don't think Nai Nai, a city girl, had ever seen a wheelbarrow and while it is hard to see here, the expression on her face in the first photo shows how unsure she was about the whole thing. You can see by the last photo, she was excited and they loved their ride to the farm next door. 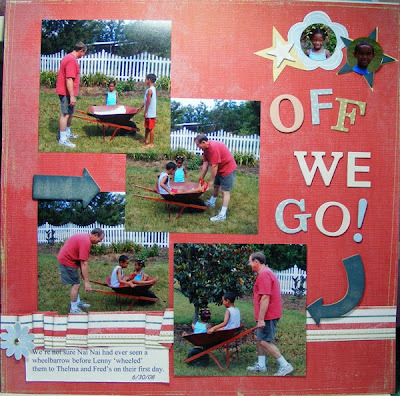 Capturing an event as it unfolds in pictures makes a great scrapbook page. The photos really tell the story. I try to scrapbook chronologically whenever possible so having this page of "Off We Go" is a good start to the rest of their visit. I've done a few other pages but of course I'm not finished yet even though they are already here for this year's visit! Chipboard letters are leftovers mostly from unknown sources. A few are Basic Grey.